Regina to Shanghai or Beijing, China - $625 CAD roundtrip including taxes | new record! Air Canada has dropped the price of their flights from Regina to Shanghai and Beijing, China down to $625 CAD roundtrip including taxes. This is a new record for the cheapest flights from Regina to China. In fact, it's a new record for the cheapest flights from Regina to anywhere in Asia! You can also fly from Regina to Shanghai, and then back home from Beijing (or vice versa), for $608 CAD including taxes. And if that weren't enough, you'll also be flying on a 787-9 Dreamliner (at least, to and from the connection point in Vancouver). 3. Try dates from the list above. When you go to choose your flights, the new Air Canada website is a little annoying. You have to hit 'Select' to choose your departing flight, and then it will bring up the returning flights. Look for the flights that are in the $300s on the way there, and in the $200s on the way back. As for the dates to use, try using starting and ending dates from the list near the top of this blog post. 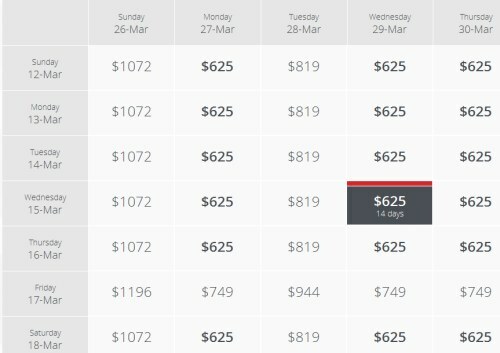 Regina to Hong Kong | $765 roundtrip including taxes | cheapest ever! regina, yqr, flight deals, asia, east asia, shanghai, pvg, beijing, pek and china.